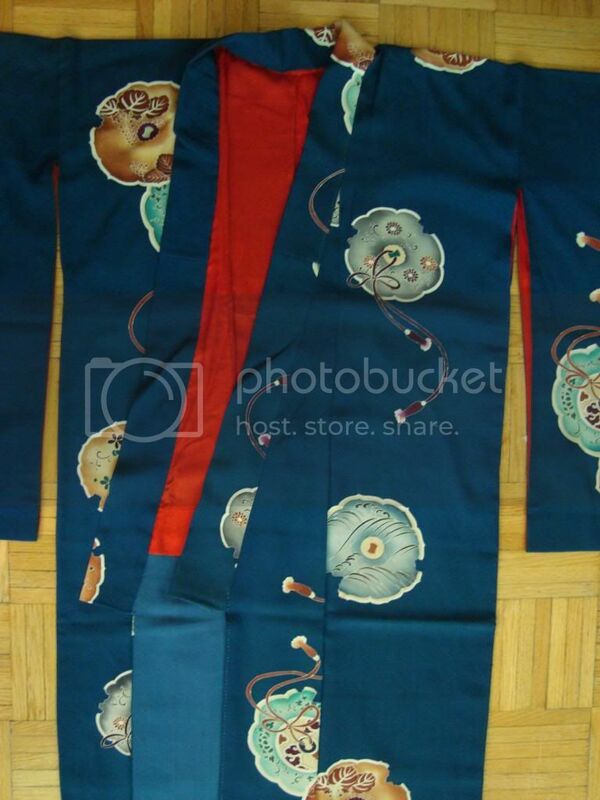 I'm very confused about a kimono I recently purchased. Not all my questions are about motifs, but the primary one is, so I hope this is the best forum to post in. Sorry, my questions are kind of all over the board. Also, the sleeves are about 70 cm long, so a fair bit longer than on the houmongi but much shorter than on the furisode I've seen. Is this a kofurisode then? And is it normal for the pattern to be broken up at the seams (between the okumi and mimigoro)? From what I've seen, the pattern should continue across the seams, no? 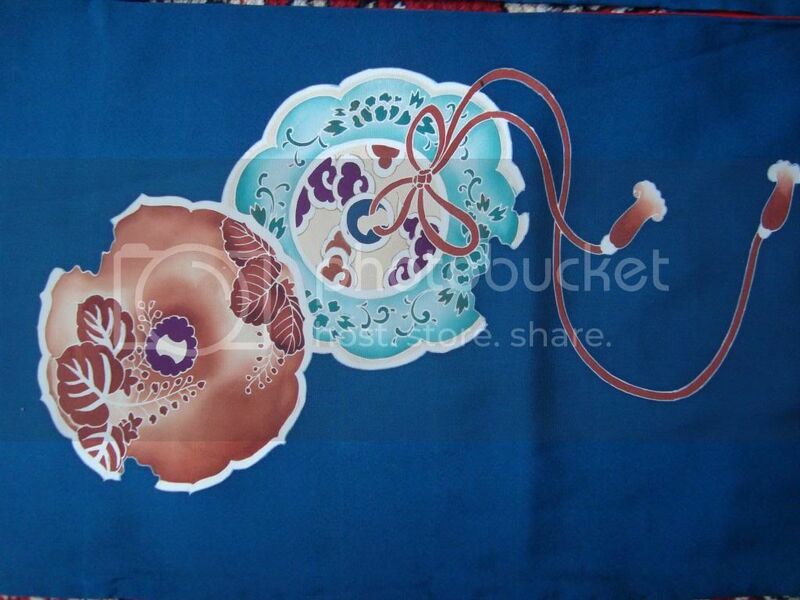 And finally, what motifs would you recommend I look for on an obi to match this? 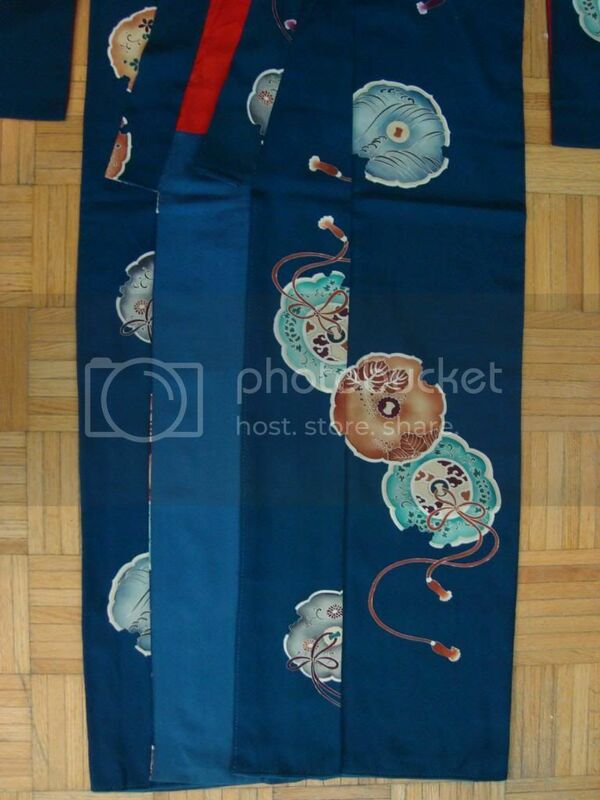 And since its not quite a furisode, would it be appropriate to wear with a nagoya obi? What you've got here is a pre-WWII era komon with a kagami or dokyo motif - traditional copper hand mirror. The longer sleeves and red lining are common for pre-WWII. The individual motifs on the mirrors seem to be paulownia, chrysanthemum, waves, and a few other things, which makes this pretty multi-seasonal. The patterns don't usually line up on a komon, since it's on the more casual spectrum. It's only more formal kimono like houmongi, tomesode, and furisode with a distinct, directional pattern that will do that. You could pair it up with any more casual obi - a hanhaba or nagoya obi, or if you could find a nice chuuya obi that could be very appropriate. Anything dressier would be hard to pull off, unless you're really intentionally playing with style. Ah, and what does the pairing of kagami and tasseled cords (btw, do they have a specific name?) symbolize?